Do y'all remember that episode of The Newlyweds with Jessica Simpson?? The one where she was all, "Sorry, I don't eat buffalo" in response to Nick asking if she wanted some buffalo wings. Pretty sure I loved that show back in the day and that comment made me laugh something fierce. Only because I'm certain I made the same comment at some point before I really knew what the heck buffalo wings were really about. Dang. I went through a period of time where I wouldn't touch ANYTHING related to buffalo wings. And then I got married and that's all Mr. Spouse wanted to eat. I learned to love them and now I'm pretty much obsessed with any and everything that has the word "buffalo" in it. 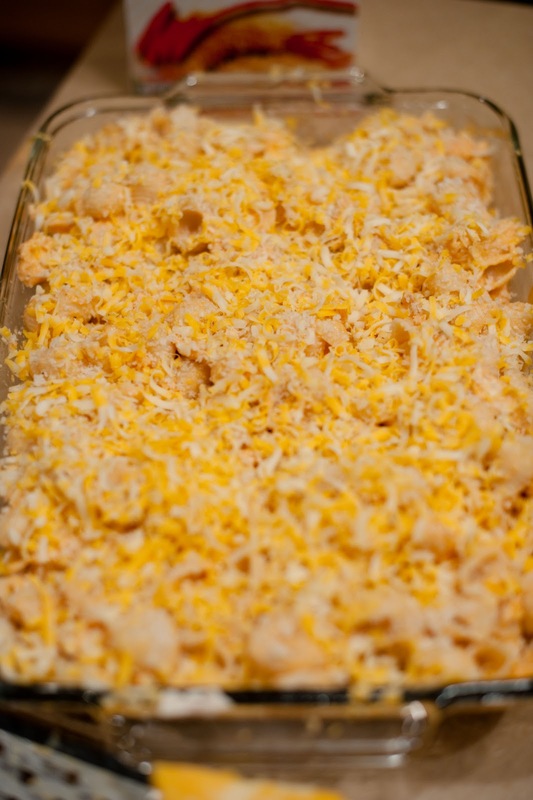 I could eat Buffalo Chicken Dip for breakfast, lunch, and dinner and I'm pretty sure it would suffice for dessert, too. 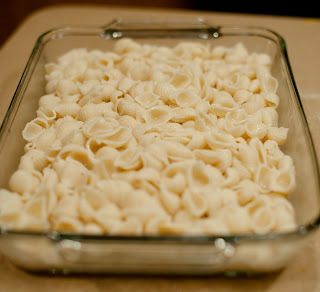 When I found this recipe for Buffalo Mac & Cheese, it was a no brainer. I knew it would be in my kitchen...and in my belly...almost immediately. And it was. And ohmiword...AMAZING. Cook pasta according to package directions, drain, and return to pot. While the pasta is cooking, heat saucepan over medium heat and add the butter. Add the flour once the butter is melted and bubbly. 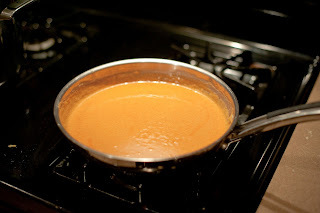 Whisk together to create a little roux and then cook for about 1-2 minutes until it starts to get a little golden in color. Feelin' all Top Chef now, aren't ya?!?! Add in the milk and turn the heat down to low. 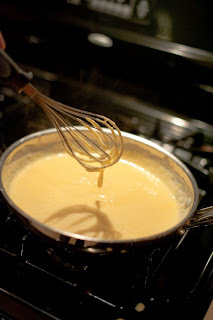 Stir until the milk thickens and add in the cheeses. Now add in the wing sauce...YUM...and mix well. You can add some salt & pepper to taste if you want. 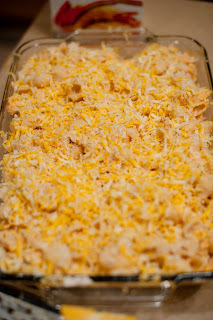 Lightly grease a 9x13 baking dish and add the pasta & cubed chicken. Mix well so that the chicken is evenly distributed throughout the pasta. Pour cheese sauce on top and make sure everything's evenly coated for maximum yumminess. Now sprinkle with bread crumbs and extra cheese. I think seasoned croutons or crushed Ritz crackers would be even better than the Panko. Don't get me wrong, the Panko was really good, but I've got a longstanding affair with croutons & crackers, so that's what I'll use next time. Bake at 375 for about 25 minutes or until cheese is golden brown. Remove from oven and drizzle with extra wing sauce. OH.MY.YUM. I went a step further and served mine up with homemade ranch dressing. GET.OUT. The only thing that would've made it better would've been a shovel so I could've gotten more in my mouth with each bite. I really hope Jessica has come to her senses and hopped on the buffalo bandwagon. This is just TOO dang good to pass up. For real. And with the Superbowl right around the corner, this is definitely a dish you want to have handy. It'll be gone in no time. The homemade ranch really made it, so make sure you have that handy!!! I served this little dish with 7Up biscuits and I was in Mr. Spouse's good graces all week long :) They weren't kidding when they said the way to a man's heart is through his tummy!!! I might have to make this for my Mr. Spouse :) He LOVES buffalo anything, I'm not a huge fan of vinegar so I might halve it or something. I've also made him the 7UP biscuits and he loved those too! Said they were a better version of McDonalds lol. Oh man, I wish I could eat my computer screen right now. 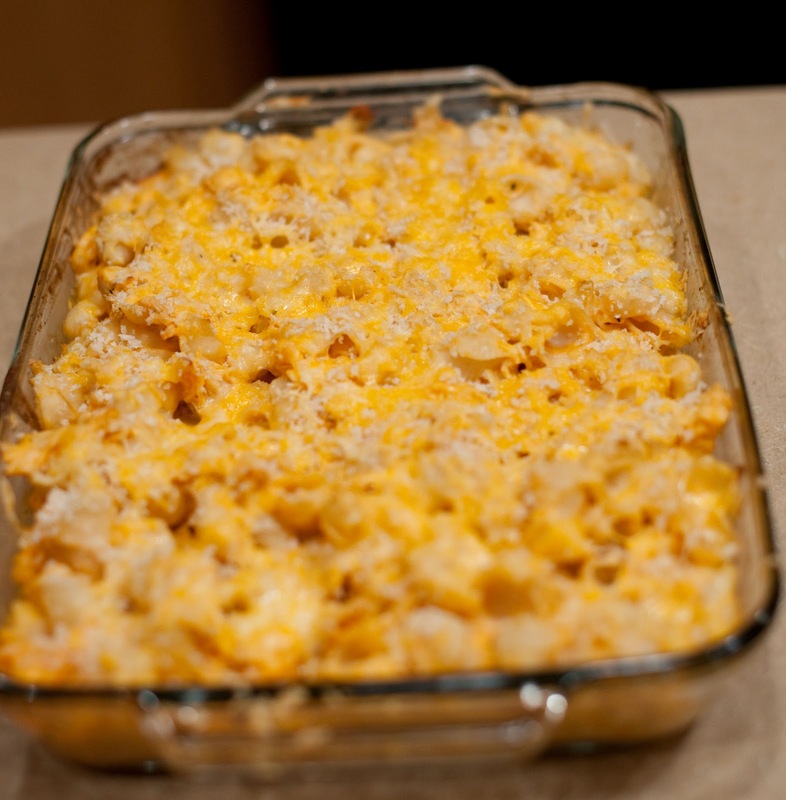 I LOVE buffalo anything and that mac n' cheese looks might delicious! OF course my hubby wouldn't eat this and either would my children but that just leaves more for me! Thanks for sharing this recipe! have you ever had real buffalo meat? it is AMAZING!! I pinned this recipe, too, and am pumped to make it now that I know it's a winner! Love the Newlyweds reference...I definitely have all the episodes on DVD (and watched them within the last year, as pathetic as that is!) It was so neat running into you at Purdue. Hope 2012 is off to a fantastic start for you! How much butter are you supposed to use? 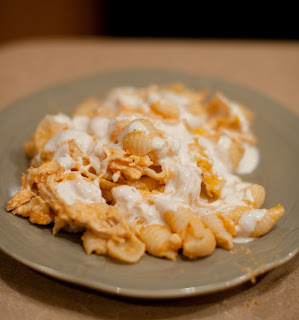 I love buffalo chicken recipes and am excited to try this one! Thanks so much! love your blog, just found it! my hubs would love this. Love this post! Must try!! Oh my goodness! This look A-MA-ZING!! omg! Sounds and looks amazing. I never used to eat buffalo wings either but my ex had to eat them every Sunday so I got hooked on them. I love Buffalo Wild Wings and buy their sauce. SO YUM. Wonderful recipe! never would have thought to use panko! definitely trying this! Do you even KNOW how much I loved newlyweds!!!!!! Hahaha soo funny. How much butter do we add? I've made this before and it is FANTASTIC! I use shredded pepper jack in place of the monterrey jack and I used bleu cheese instead of ranch (I'm mildly obsessed with bleu cheese). 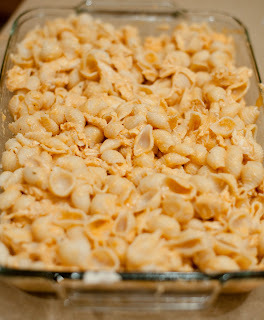 Seriously may be my all-time favorite recipe...I'm a buffalo freak! :) Thanks for sharing. I will have to make this for our next dinner with friends! My hubby is loving all things buffalo as well! Poor newleyweds! I wish they were still on tv! Ps- I love the chicken and rice soup. It's amazingly awesome!!! Thank you for sharing! 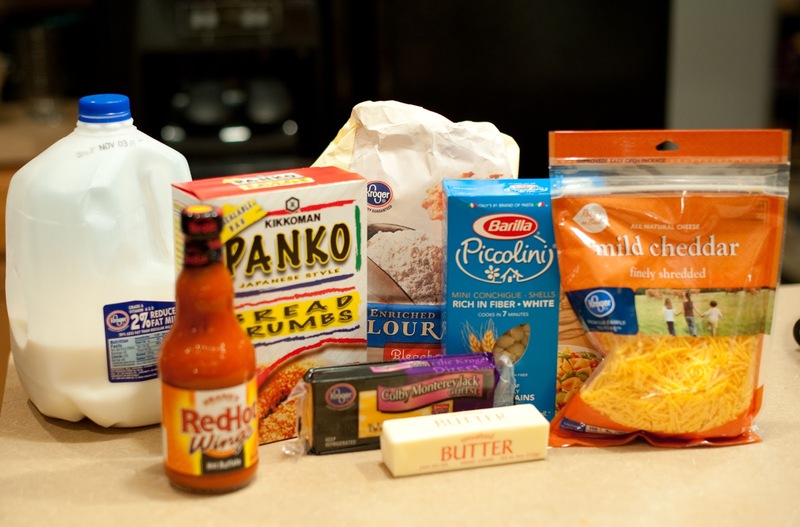 Do u have a recipe for your ranch? Made this for my family tonight. With a salad, it was awesome!! And delicious! I just made this for dinner...followed the recipe to a T...had to douse in more hot sauce after because it came out really plain. When I scooped it out, the pasta looked white, you couldn't even see the sauce. And I can't taste it either. Next time I'll double the recipe for the sauce, I'm sure then it will come out delicious. Tried it! It turned out awesome! Only 1 correction to the recipe.. 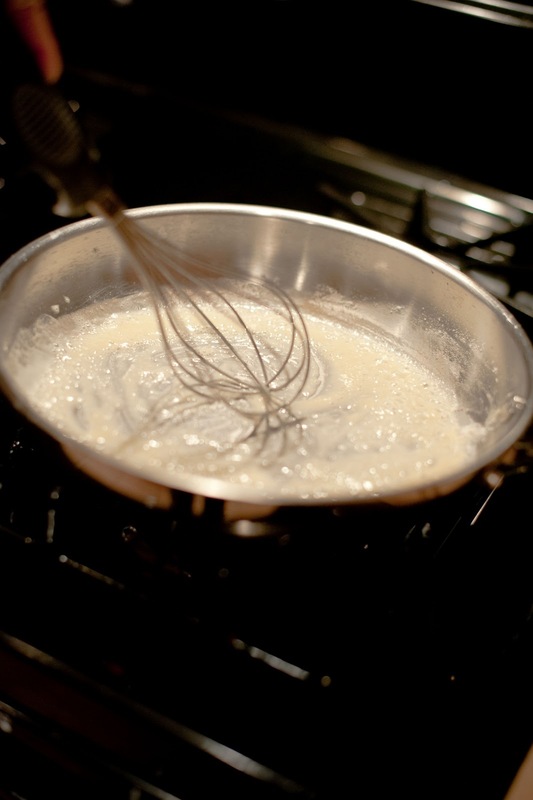 When it says to make the roux.. I tried using about 5 table spoons of butter to 1 table spoon of flower and it just wouldn't thicken when i added the milk. My husband said that you need equal parts of fat and flower to make a roux. I remade it and it turned out awesome! Thanks for the recipe!! Thank you for a GREAT quick and easy dinner! I am going to try this recipe because I so love buffalo anything and Mac and cheese was my mom's craving when she was preggers with me 50 plus years ago! 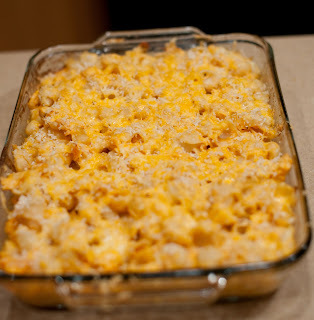 I am going to try this because I love anything buffalo and my mother's pregger craving was mac and cheese and I love Mac and cheese to this day any and all cheese! When I announced that this was for dinner, my daughter said, 'You DO love me, Momma!" Oh, this sounds delicious! I love anything spicy.